Modern malls, a metro-in-the-making, late night munching, inner city mountains and hoards of monkeys. 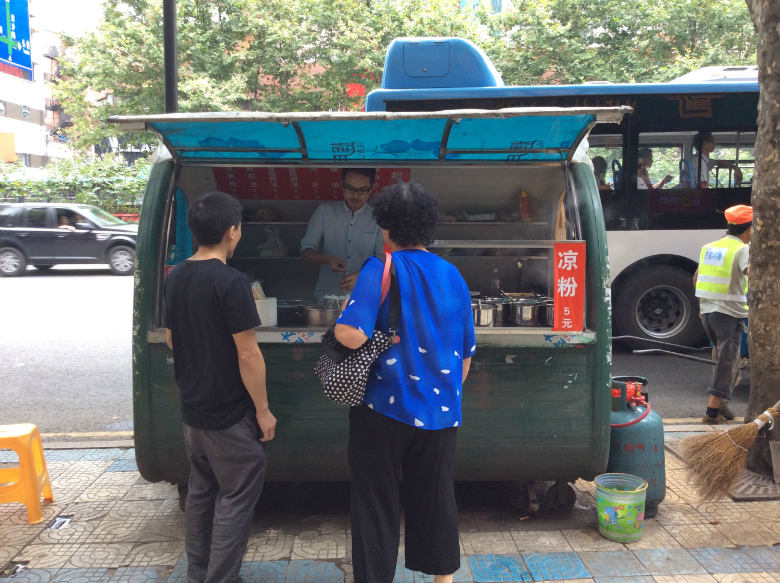 Youthful, modern, liveable, non-touristic, Guiyang was a breath of fresh, polluted air. 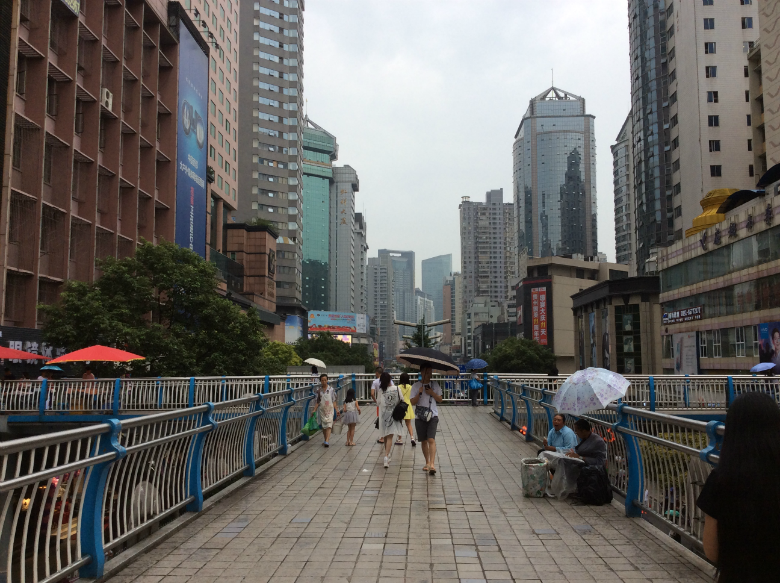 Guiyang is a city on its way up, growing swiftly into a steely shiny Chinese megalopolis with large sections of its wide roads currently fenced off whist a metro is built. 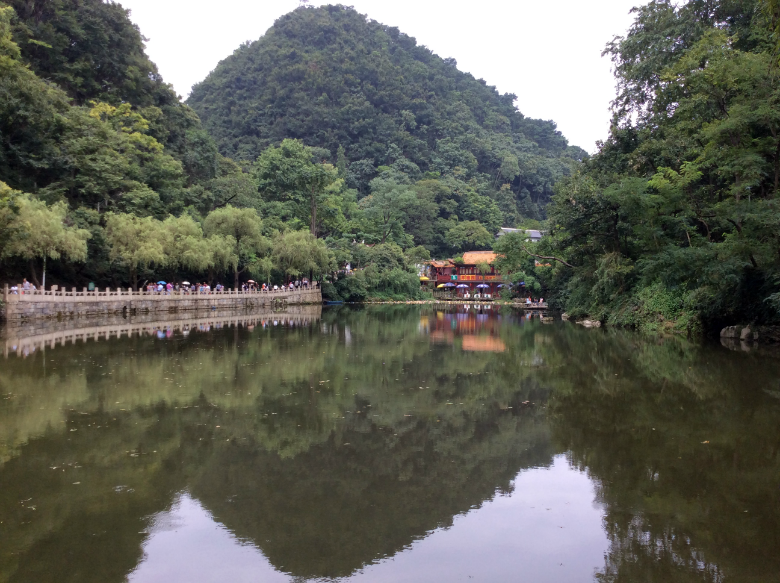 Far from popularly perceived China and even further from the tourist trail, Guiyang sits in the South West of Guizhou Province as its capital. Skyscrapers framed with strips of neon illuminate the night, raised walkways connect destinations. 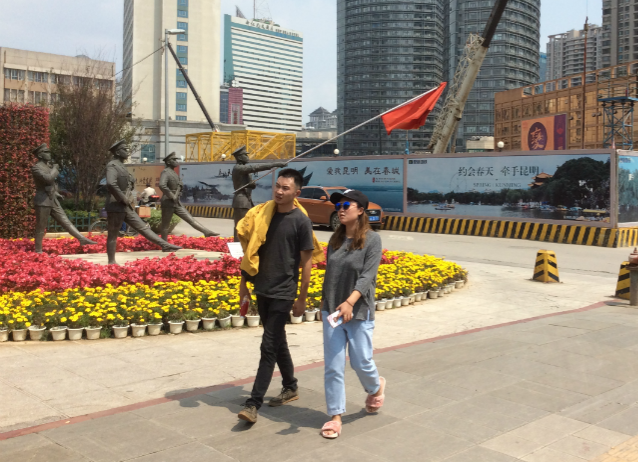 Threaded through the streets are patches of youthful culture—upscale bars and contemporary restaurants reveal an awareness of a world outside of China, albeit under construction. 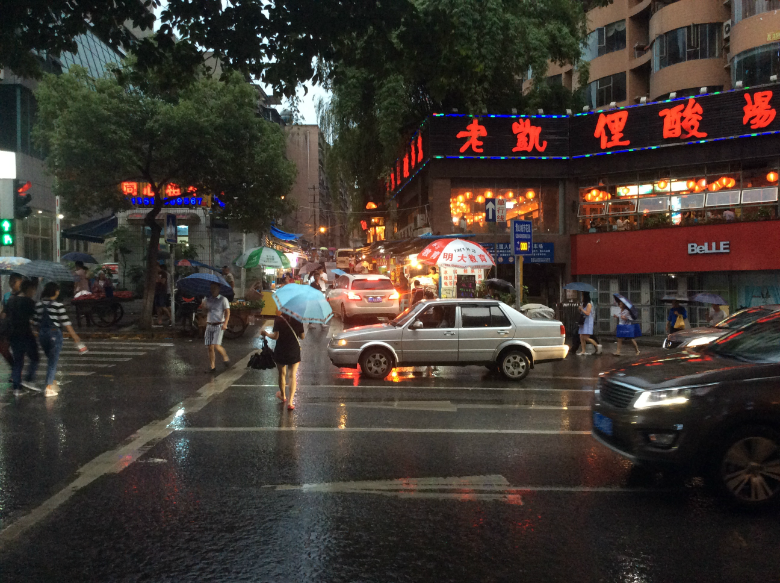 A swift two-night stopover in Guiyang left us one full day to see the city. After arriving by train we jumped into the back of a rusty old cab with an interior that was saturated by the stench of stale cigarettes. Our driver gave off a threatening vibe sat in his seat surrounded by a metal cage. 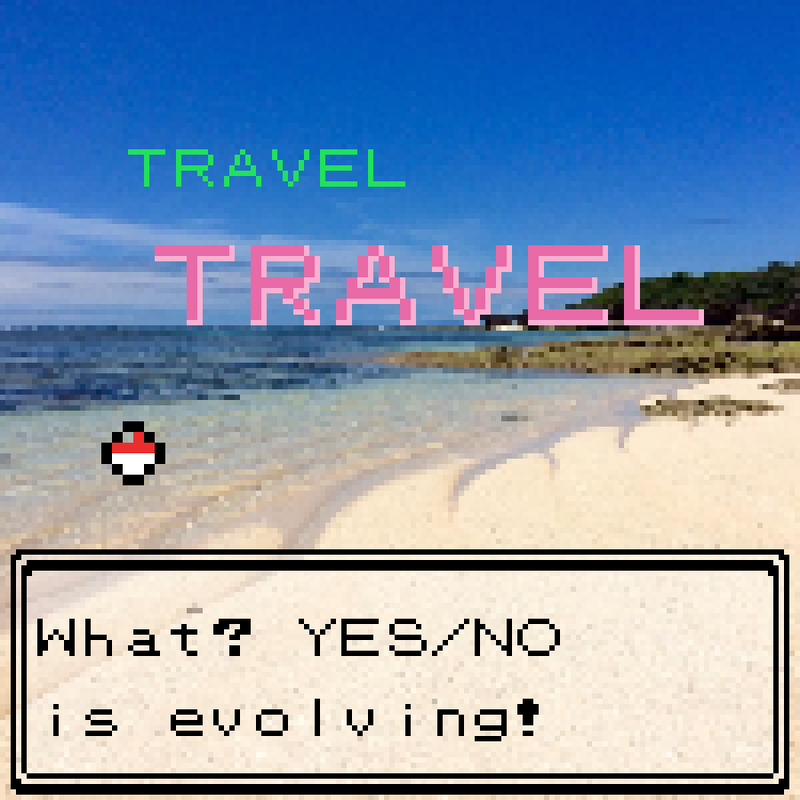 Pointing at a screenshot of a map on our phone and using some bare threads of shared language we began slowly snailing our way to the hotel. 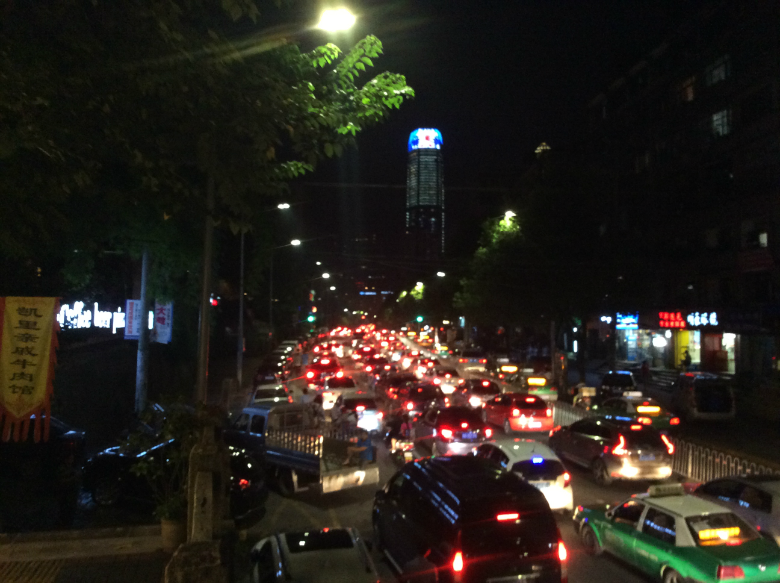 Traffic surrounded us: the windows open, exhaust fumes pouring through them and into our lungs. Our heads began to hurt, an hour breathing in petrol made our skin feel grey. 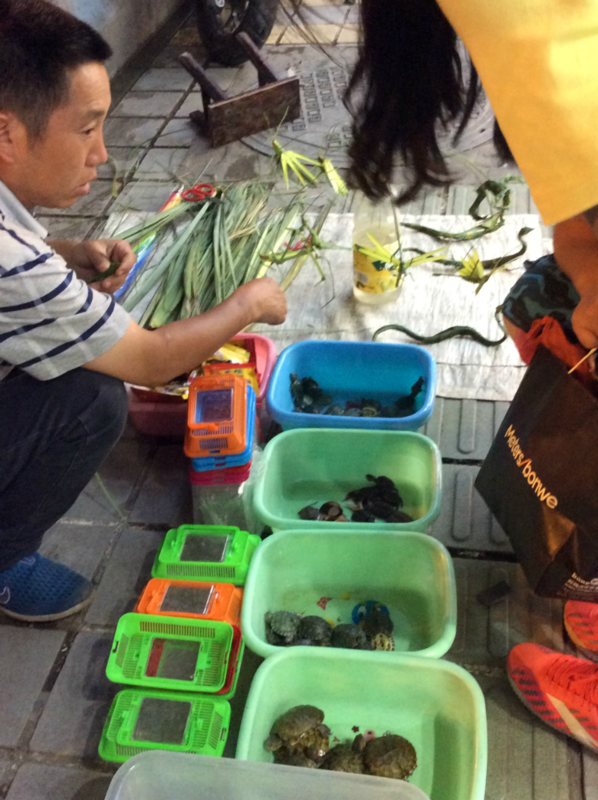 Had we come across one of those famous Chinese polluted mega-cities that are so often linked to modern day, iPhone-producing China? There wasn't a lot of information on sights to see in the city. With not really much to go by in terms of tourist tips we thought we would do what so often leads us into interesting situations: walk. We walked through the centre of town on a Sunday, following the GPS on our phone towards a park we had read about on wikitravel. Along the route we stopped off here and there for snacks and goodies sold by cheerful stallholders. Munching on pastries with unknown fillings was perilous but paid off. 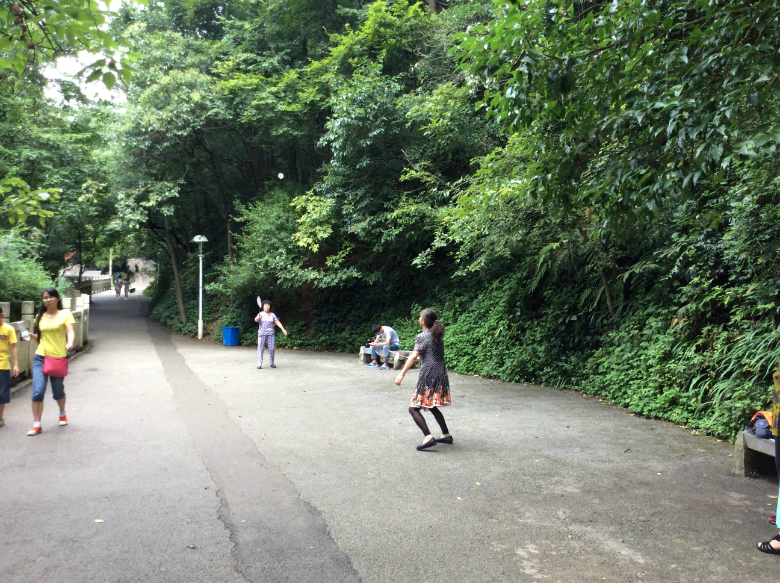 We ambled nearer towards the Qianling Park (黔灵公园). In an underpass near a main road we helped a lady with a small child with her luggage up a flight of stairs – she seemed a taken aback by the casual offer of help from a stranger. 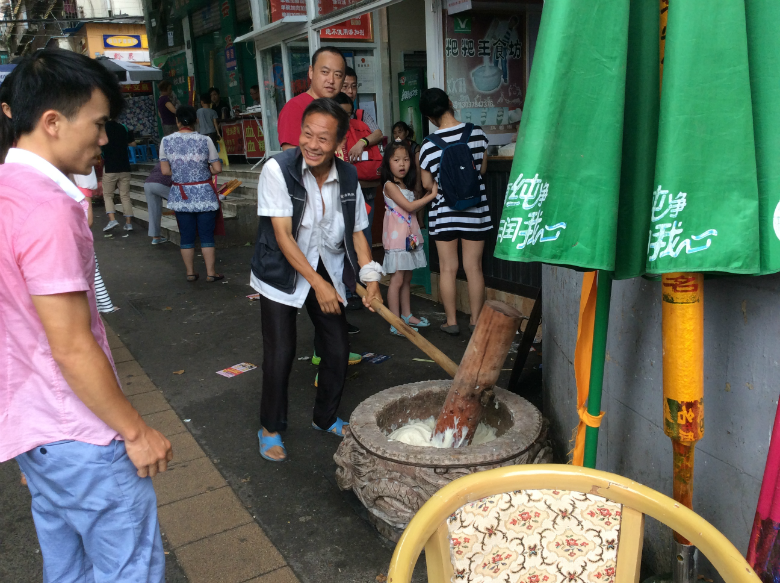 On the street that lead up to the entrance of the park we joined crowds of locals and a few domestic Chinese tourists. Vendors behind stalls lined the pavements, hot snacks, refreshing drinks and colourful toys on sale. 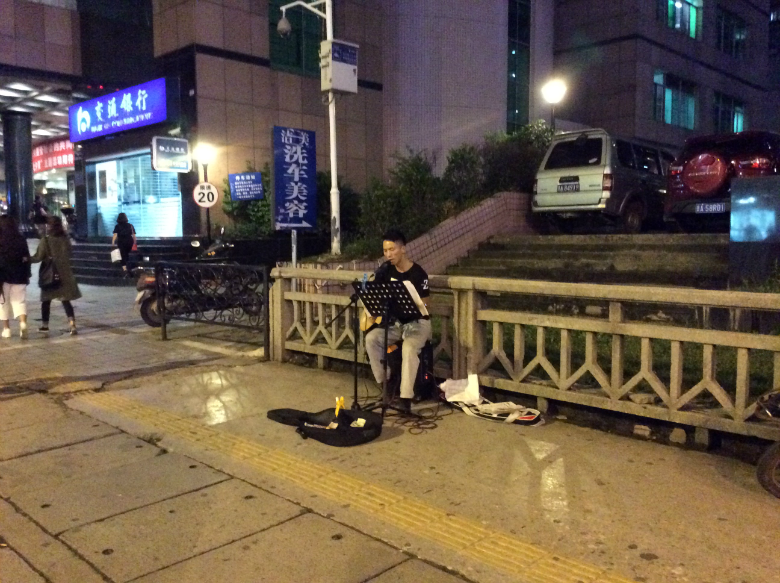 A lady campaigned for money and help for her disabled daughter, not begging, but spreading awareness of her plight. 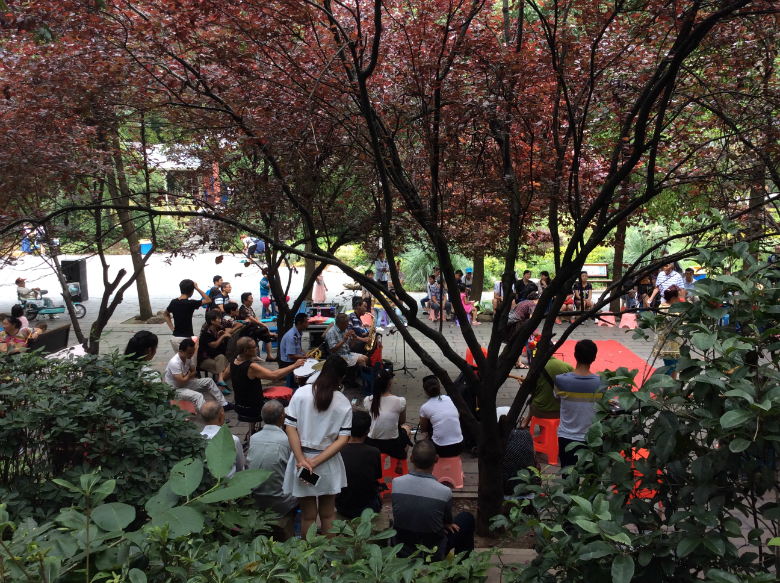 People were out enjoying a leisurely weekend in August, the peak of China's summer vacation. Through the gates of the park the people of Guiyang had come out to enjoy what they liked to do in their spare time: a middle-aged lady happily wailed some painfully loud songs accompanied by a small band mainly made up of park staff; ladies in floral two-pieces played badminton on the path; a man hiked at top speed past us, belting out with operatic skill whatever flamboyant music was blasting out of his hip-mounted speaker. Nobody blinked an eye. There was also a cave to walk through and explore, gaudy, lit-up and shrine-filled. 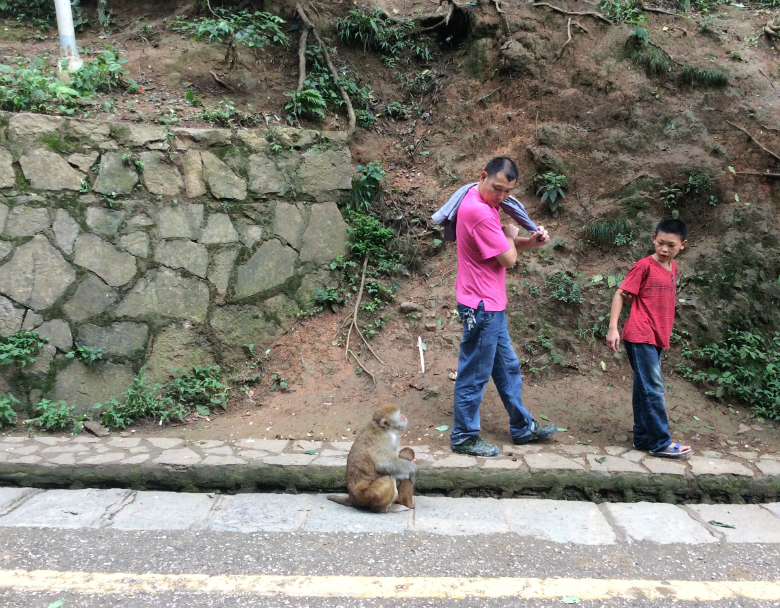 The strangest attraction was the hoard of greedy monkeys that negotiated hillsides to grab snacks from overkeen spectators. Observing the fear and amusement on the faces in the crowd as they offered up treats to the simians was comedic, though a disturbing undertone loomed behind it. 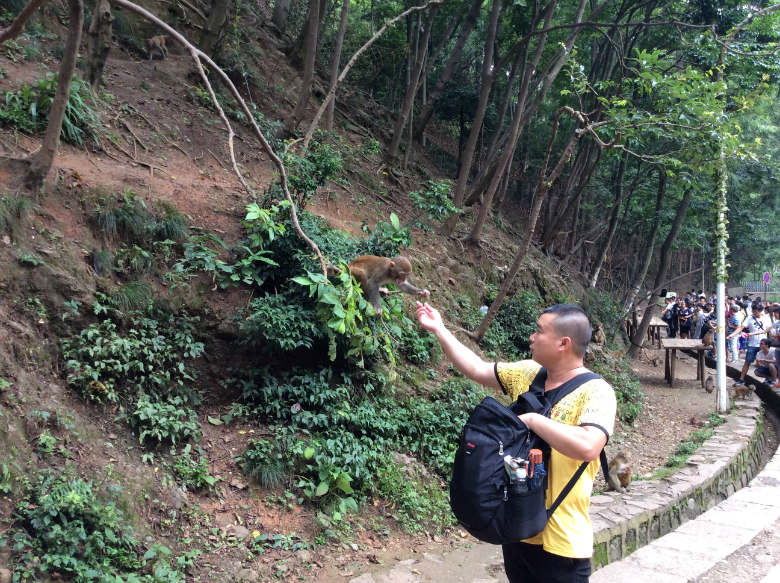 A man approached a monkey dangling on a branch; he smacked it on the head abruptly and then gave it some food. 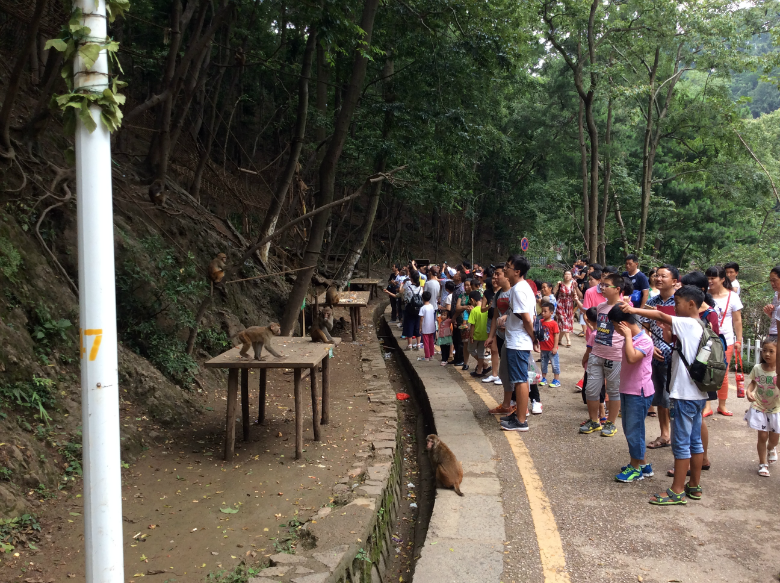 A terrible feeling of sorrow for these animals dawned upon us and we navigated our way out of the park, suddenly overwhelmed by the crowds. Clashing and chaotic, China's modern world is confusing. Outside a shiny-fronted mall in the evening animals were targeted again, this time in the role of being sold for pets. The pop-up petshop bewilderingly contrasted with the backdrop of the fresh upscale shopping centre, built for the newly wealth-and-trend-aware twenty-somethings of the city. 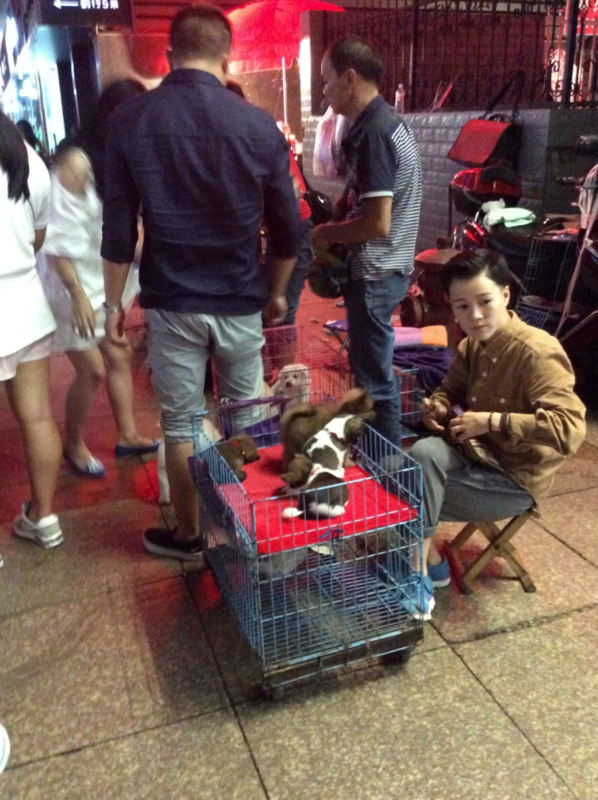 The puppies on sale were puffed up, preened and prettied and packed into cages ready to make a wad of yuan for the strange stall holders. 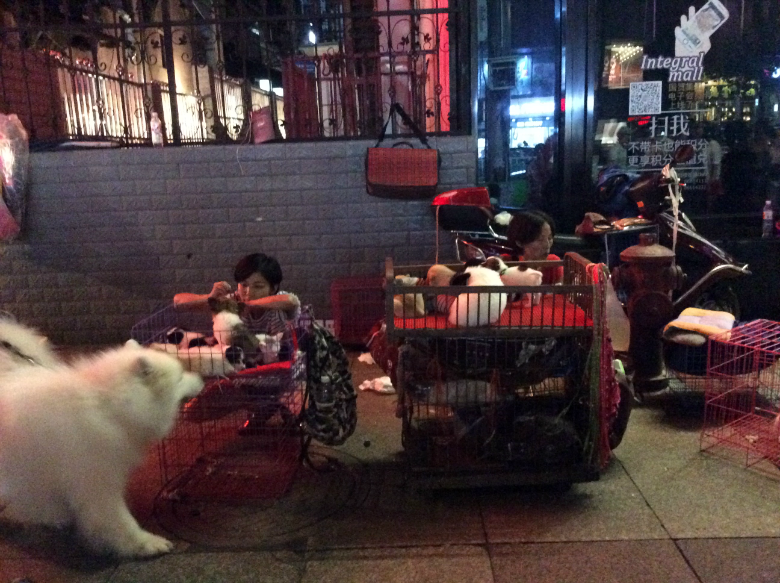 Twenty-something spectators cooed around the captives. Stepping into the mall itself we felt mistaken for paragons of wealth, bored shop assistants stared and beckoned to us to from afar. A vibing palace with a clean white gleam, built for the people of Guiyang so they can be seen to be there, each shop showed off different takes on selfie-ready styles: all-out aspirational Chinese consumerism. 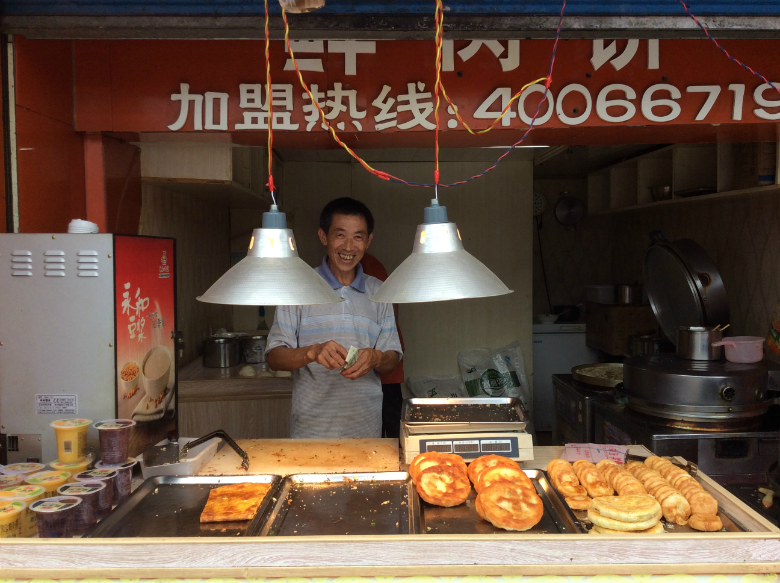 In the end, I have to wander"
China has the exterior of a tough and hearty nation. On our short weekend visit to Guiyang we felt beneath the skin of the People's Republic, saw the people of country in the midst of international news, border disputes, questions on human rights violations, Beijing and Shanghai-centric business decisions and its evolution of soft power world dominance. 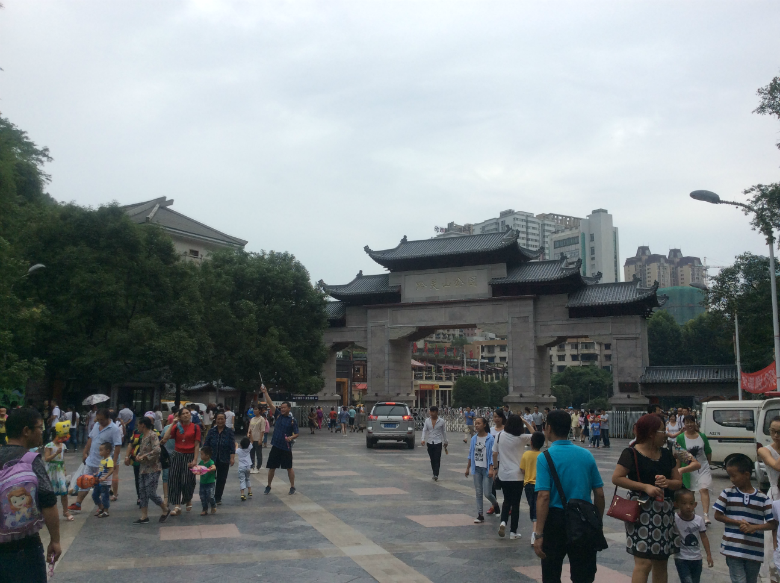 In many ways Guiyang was one of the best places to learn about a China in the midst of modernisation. We were spectators to the speed of mass growth that China has become so synonymous with; the smoky haze of pollution and mall-shaped optimism, inquisitive stylish socialites, offensively brash and unexpectedly genuine and gentle friendliness are all China. This is part of a tower block that overlooks the Fountain Pool intersection, a central area of the city. The location, therefore, is the seller. The room we stayed in was very small, furnished with a desk, a chair, a TV, a bed – let's call it "cosy" – and whether this room was officially smoking or non-smoking, we weren't able to tell. The hallways were dim and carpeted. Persistent stale tobacco smell. These things didn't bother us. The staff are helpful enough, though spoke very little to no English. You get the lift down, say hi to the receptionists in the tiny lobby, walk through the double doors and you're in it, you're really in the city, food and drink and shopping and sights all very walkable. Both evenings we discovered a call girl postcard slipped under our door.